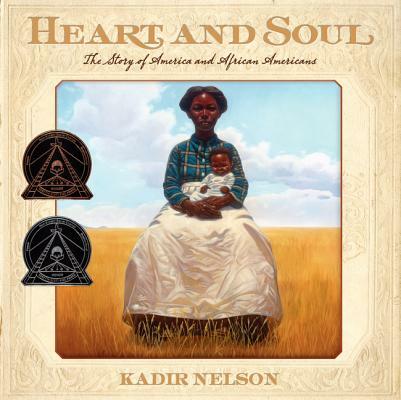 Kadir Nelson's Heart and Soul is the winner of numerous awards, including the 2012 Coretta Scott King Author Award and Illustrator Honor, and the recipient of five starred reviews. The story of America and African Americans is a story of hope and inspiration and unwavering courage. This is the story of the men, women, and children who toiled in the hot sun picking cotton for their masters; it's about the America ripped in two by Jim Crow laws; it's about the brothers and sisters of all colors who rallied against those who would dare bar a child from an education. It's a story of discrimination and broken promises, determination, and triumphs. Told through the unique point of view and intimate voice of a one-hundred-year-old African-American female narrator, this inspiring book demonstrates that in gaining their freedom and equal rights, African Americans helped our country achieve its promise of liberty and justice—the true heart and soul of our nation. Kadir Nelson won the 2012 Coretta Scott King Author Award and Illustrator Honor for Heart and Soul: The Story of America and African Americans. He received Caldecott Honors for Henry's Freedom Box by Ellen Levine and Moses: When Harriet Tubman Led Her People to Freedom by Carole Boston Weatherford, for which he also garnered a Coretta Scott King Illustrator Award and won an NAACP Image Award. Ellington Was Not a Street by Ntozake Shange won a Coretta Scott King Illustrator Award. Nelson's authorial debut, We Are the Ship, was a New York Times bestseller, a Coretta Scott King Author Award winner, and a Coretta Scott King Illustrator Honor book. He is also the author and illustrator of the acclaimed Baby Bear. As in WE ARE THE SHIP, Nelson knits together the nation’s proudest moments with its most shameful, taking on the whole of African-American history. He handles this vast subject with easy grace. [Nelson’s] jaw-dropping portraits radiate determination and strength. A tremendous achievement. The dramatic oil paintings heighten the dignity of this story, whether they are of well-known historical figures, common folk or landscape…This intimate narrative makes the stories accessible to young readers and powerfully conveys how personal this history feels for many African-Americans. Nelson…adds to his notable titles with this powerful view of African American history. Illustrated with 44 full-page paintings, this handsome volume is told in the fictionalized, informal voice of an African American senior looking back on her life and remembering what her elders told her. Provocative and powerful, this book offers a much-needed perspective for individuals of all ages seeking to understand America’s past and present. Nelson effectively creates a voice that is at once singular and representative. A tour de force in the career of an author/artist who continues to outdo himself.